Bronson Rock Garage is a family owned establishment which originated in 2017. Our company offers a wide range of services which includes tours, motorcycle apparel and an extensive motorcycle training academy. The Bronson Rock Garage name came from the television series ‘Then Came Bronson’ where the character utilised any nearby object for example a rock, stick or butterknife to repair his motorcycle when he was on the open road. 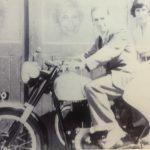 Riding motorcycles runs through our family, seen below is a photo of our great grandfather and great grandmother Sydney and Elizabeth on the back a Norton Motorcycle. The generations following have exhibited the same passion of riding, which extended through to us aiding in the creation of Bronson Rock Garage. Bronson Rock Garage offers services for people of all experience levels. This ranges from a novice rider who has never sat on a motorcycle before through to an experienced rider looking to refresh and refine their skills. Our aim is to provide a motivating and positive environment ensuring each individual is comfortable and enjoying learning their new skills. We hope to see you soon at Bronson Rock Garage!